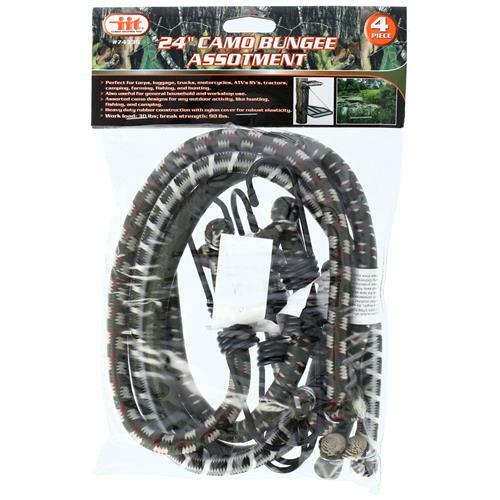 Perfect for tarps, luggage, trucks, motorcycles, ATV's, RV's, tractors, camping, farming, fishing, and hunting. Also useful for general household and workshop use. 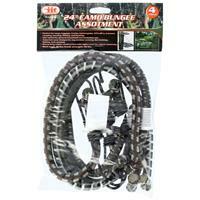 Assorted camo design for any outdoor activity, like hunting, fishing and camping. Heavy duty rubber construction with nylon cover for robust elasticity. Work laod: 30lbs; break strength: 90 lbs. 7.87" x 16.54" x 6.69"